These machine features compact & robust construction, low noise & are equipped with safety features. Available in both conventional Bull gear design & unidrive type. These special kind of mixing mills are used as experimental equipments in rubber & plastic Industry. These are used for testing & mixing a small quantity of rubber & plastic compounds in order to get a uniform material in conformity with customer's request which shall be utilized for mass production. The stock Blender is Installed on the two roll open mill for assistance to the operator in mixing of rubber material & chemical powder. It features automatical - continuos operation, saving labour, operator's safety, descending temperature of material, fast mixing & better quality mixing of rubber & plastic compound. Santec manufactures various machinery i.e. cracker, grinding mill, refiner etc. for regenerating the waste tyres or waste rubber products & rubber scraps to get the reclaimed rubber. 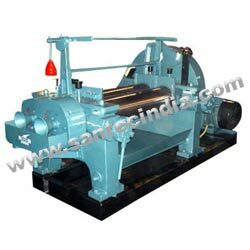 Santec manufactures heavy duty dispersion kneader machine upto 150 ltrs. Capacity with or without PLC controlled operation. Its mixing effect is better than that of open mixing mill & its cycle time is as fast as that a intensive mixer. Santec manufactures rubber bale cutters to cut various rubber bales. The cutting capacity is available in 12 tons & 20 tons. These bale cutters are available in double cut & 4 piece cutting bales with or without rollers for easy movement of rubber bale. Calendar machines are available in two rolls, three rolls, four rolls & five rolls to produce PVC floor tiles, automobile tyre, footwear rubber sheets etc.